﻿﻿ going on. Great "ice breaker" for a gathering. 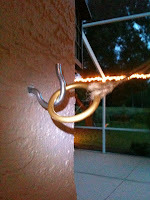 The twine or thin rope is attached to the ceiling and the hook on the wall. Here are some directions. The ultimate word here is "should". If you get close- Go With It! The hook should be 5’ up the wall. The string should be 5’9” away from the wall. The ring should be 18” from the floor when hanging at rest. You can create your own "rules" and scores. As there are just the two of us now....we have marathons!! However you can fine some different games/rules on the Web. We didn't have this until our 5th house in NC. We definitely needed it after a trip to the Exumas in the Bahamas... We played often when visiting Bimini. We thought about leaving it for the new owners of the house in NC...but I already left them my Gnome which didn't go over well with some of my friends. my brother loves this game! i've never played but it seems like something i'd get addicted/competative with! I think I'll have Lou hang one for our patio! Thanks for the instructions on how-to. Love you girl!